I'm also kicking around the idea of a roller bearing bottom bracket. We just received the final prototype of the Grand Cru high-low hub. We were going to use an alloy cassette body, but I changed it to chromo. It's just more practical and durable. 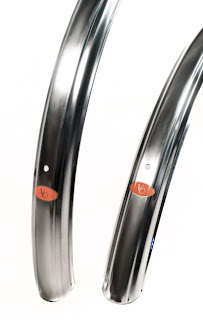 Some, but not all, versions of the VO-Maxi hubs are in production, or very close. Just wanted to let you know that we got another fender shipment and we have the new polished alloy VO 58mm fluted 650b fender. 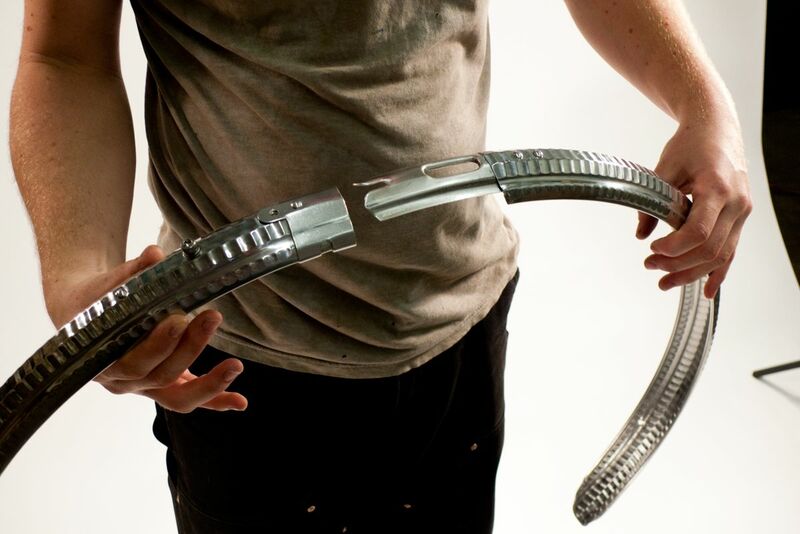 These fits tires up to 46mm wide. 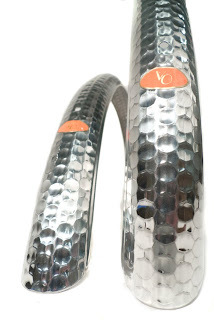 We also have a more of our popular 45mm x 700c hammered fenders. These are selling very fast so we'll probably run out again. And we have the VO 48mm x 700c fluted fenders again. 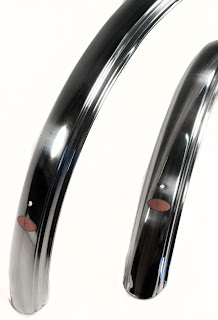 Finally, the 37mm x 700c alloy fenders are back. These fit tires up to 28mm. 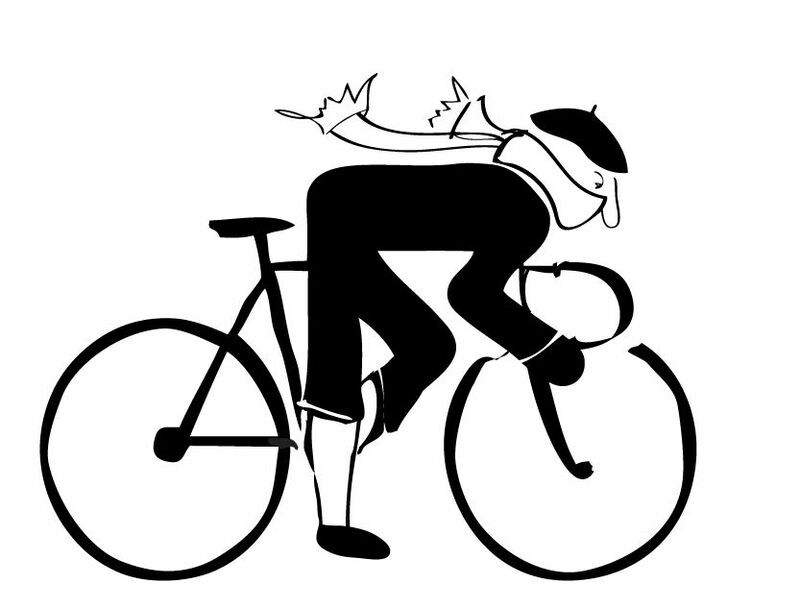 We're importing a new rear rack. 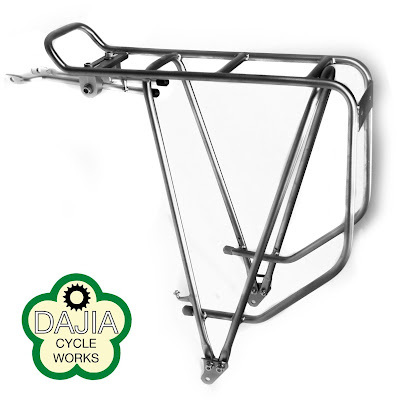 The Dajia Expedition Rack a sturdy stainless steel rack intended for loaded touring. It's not as nicely made as a VO rack, but both the quality and price are impressive. It has a sandblasted gray finish and is perfectly sized for 700c wheels, but can be used on 26" and 650b frames as well. There a rear light mount with holes at the standard 50mm spacing. There are pump pegs spaced at 235mm. Maximum load is 25kg, or about 55lbs. Note that this rack is intended for real touring frames, so if your frame has short chain stays and you have big feet, there might be heel clearance issues. Matching front low-rider racks should arrive by late summer. 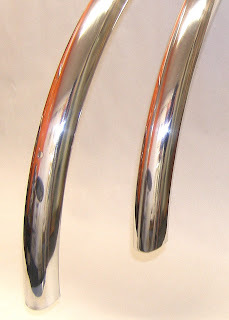 Velo Orange front and rear camper racks are also in the works, but they will be considerably more expensive. I see so many bikes with incorrectly installed toe clip straps. Here is how they should look. 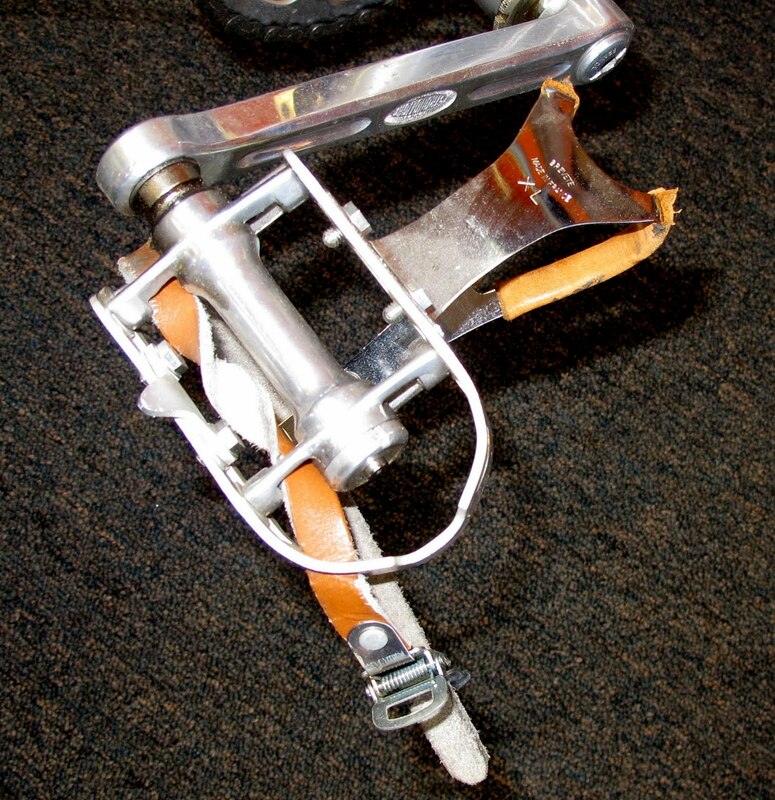 Note that straps should be a tight fit through the holes in the pedal body. 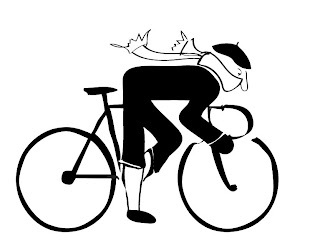 This is so they don't shift while pedaling. 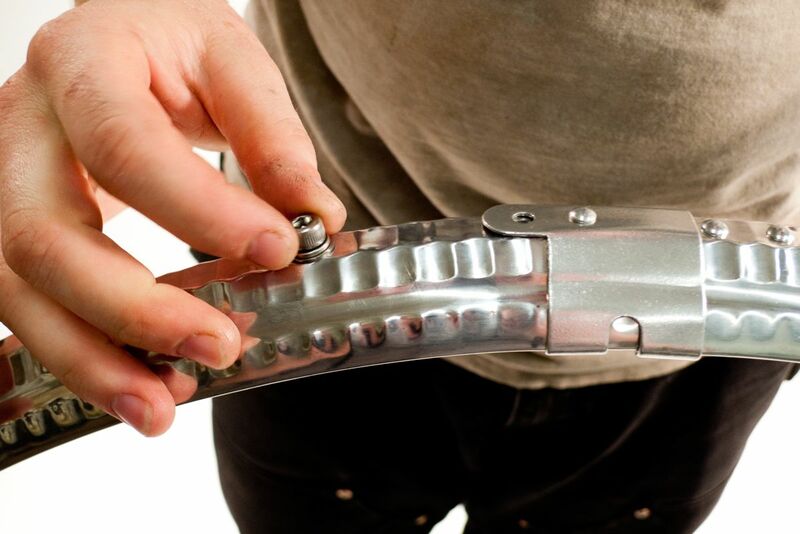 In addition, it's wise to add a twist in the strap to further prevent shifting. I've also seen a few bikes with fender eyelet bolts incorrectly assembled. 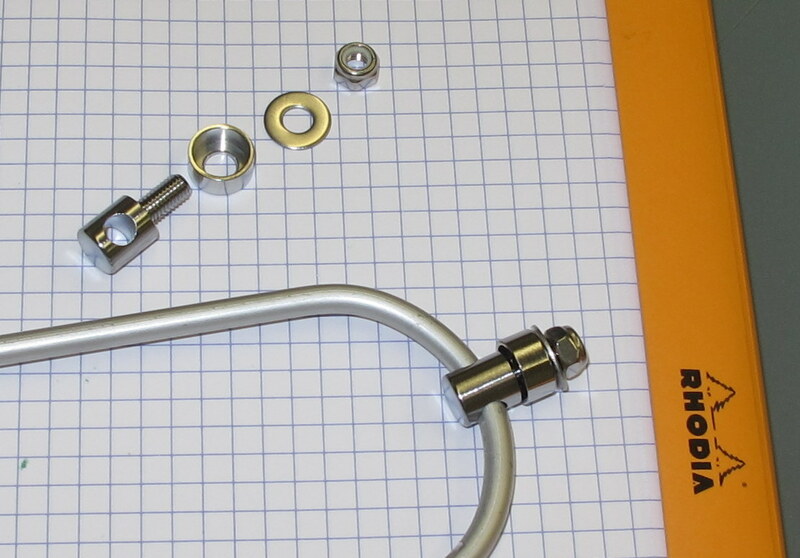 Usually the problem is that the cup-washer is reversed and the stay rattles in the eyelet bolt. Below is the proper assembly sequence. Note that the cup-washer faces up so it tightens on the stay. The fender goes between the flat washer and cup washer. 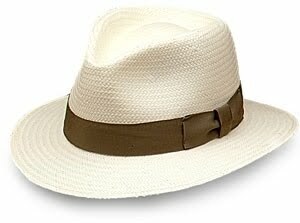 I think white Pasela tires look really cool, especially if you ride in a Panama hat. We have them in 700 x 28mm size. We've decided to introduce VO needle bearing headsets. 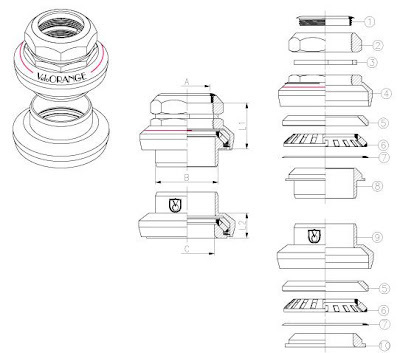 They are already in production and will be priced between the VO and Grand Cru headset. 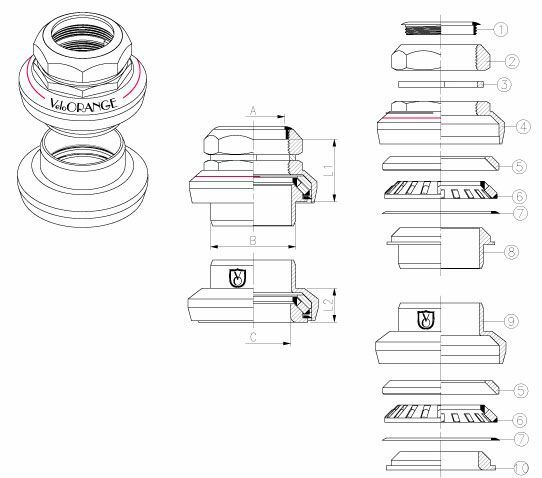 Stack height will be 37mm and they will be available in ISO size only. 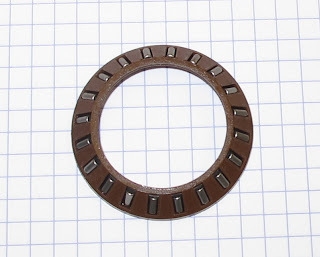 Needle bearings have more surface area than ball bearings so they usually last longer. The added surface area also prevents indexing, the clicking that results from little pits formed by worn ball bearing races. Needle bearing headsets are also said to reduce fork shimmy. We should have them in late August. I've written about Rinko in the past. 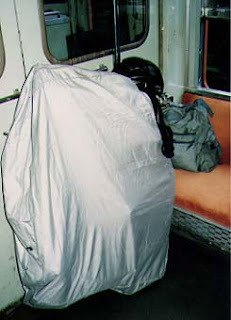 "The basic idea is that if you put your bike in a "rinko-bukhuro" (a lightweight nylon bike bag) you can take it with you in the passenger compartment of a Japanese train. Since Japanese trains are fast, punctual, and plentiful, this seems a fantastic way to tour various areas of the country in one visit." To facilitate Rinko, Honjo makes fenders that have removable sections. 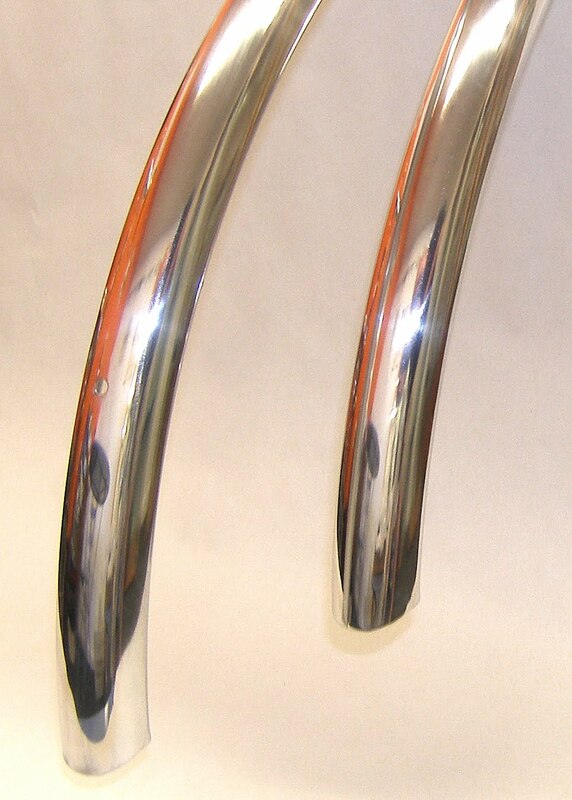 We ordered a sample set of 50mm hammered Honjo fenders early last year. They finally arrived. 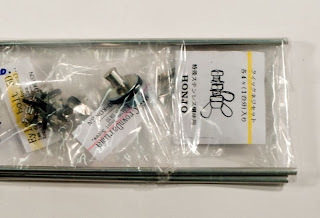 We had planned on stocking them, but ever increasing Honjo prices mean that they would now sell for over $250. That's a lot for a pair of fenders and I doubt we could sell enough to justify importing them. Still, I thought you'd like to see a couple of photos. 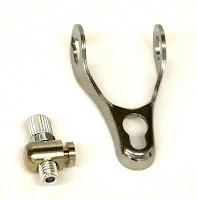 In addition to the joint in the fender, the Rinko fenders have special hardware with wing nuts at the dropout eyelets, so the stays can be easily removed without tools. Before you ask, Perry already bought this set for his upcoming Banjo Camper frame. And, no, they cannot be special ordered unless you want 50 sets. Sorry. We're messing about with graphics and design elements for the new and improved VO web site. Kyle made this image, which I think is great. Site development is coming along nicely and we're hoping to have the new version up in about 6-weeks. There will be a lot of added functionality and features, including re-stocking notification via e-mail and more shipping options. Are there any features or functions on other web sites you've seen that we should consider? We have a few new items. 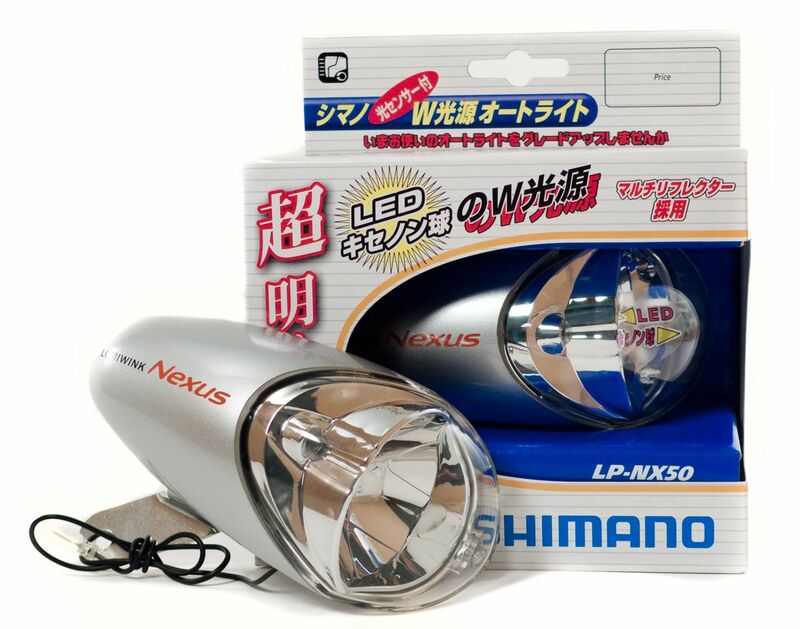 The strangest of these is the Japanese market Shimano Nexus LumiWink light that Tom managed to find. 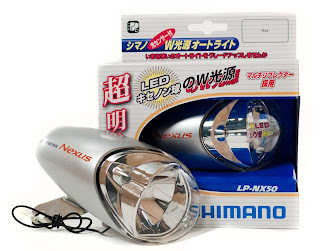 It has an LED bulb that flashes whenever the dyno is turning. It also has a standard 2.4w halogen bulb that lights when a photo cell detects low light level. There is no on-off switch. The instructions are in Japanese only, but there are pictures. Being Japanese, it mounts on the right side of the bike. This is a special purchase item and is non-returnable, but then they only cost $18 $10. VO front Constructeur racks have made it back into production. 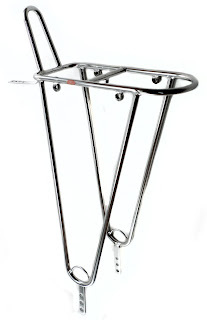 The constructeur rack is a medium sized front rack that is attached to the dropout eyelets. 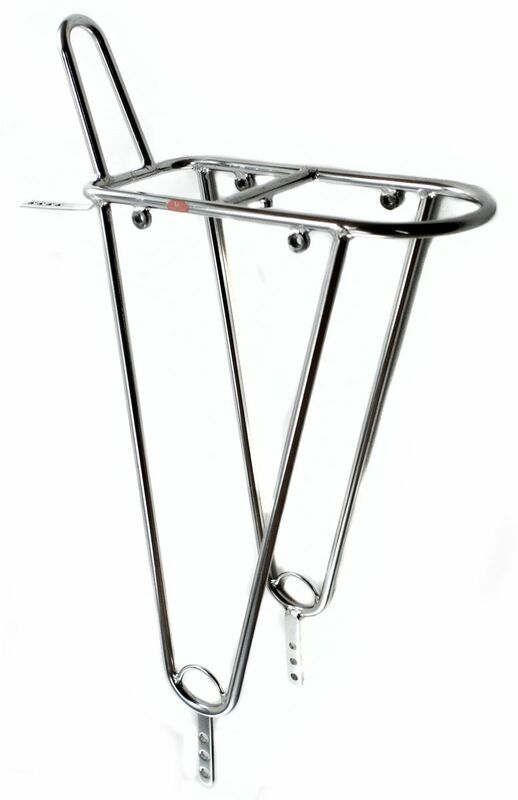 It's made from polished tubular stainless steel, just like out other racks, and has eyelets for lights and a fender mount. We've received a small shipment by air freight and the rest should be here in about a month. We also received more of the perpetually-out-of-stock Porteur racks. Finally, we have a rather clever new rear quick release cable stop. It uses a keyhole-shaped slot to hold the stop/adjuster part, so it can be instantly detached to open the brakes for tire changes. 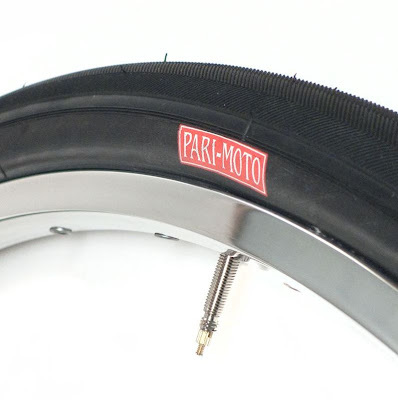 We just received the first shipment of Pacenti Pari-Moto 650b x 38mm tires. In fact, I think we're the first shop to have these. Pari-Motos are a new very high quality and supple tires made by Panaracer in Japan. Panaracer also makes the Grand Bois, Col de la Via , and various Rivendell tires, but these are made in a new mold. The tread is a fine herringbone pattern, my favorite. The width is an honest 38mm on VO Diagonale rims. I suspect they will stretch to 39mm in a few days. That makes them a touch wider than Col de la Via tire and about as wide as the 42mm Hetre tires (which measured 39.5mm on my bike). There are two versions. 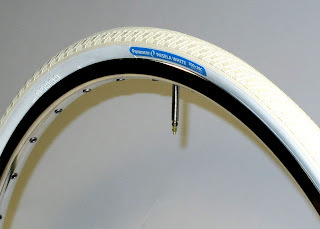 The all black tires use a 127tpi casing while the tan-wall tires use a 67tpi. This means that the black tires should, in theory, be a little more supple. In practice I doubt you'll notice a difference. The black version weighs 280g, while the tan is 300g.